As reported in the Notice of General Meeting of Shareholders, there is a difference between consolidated and non-consolidated results in net income for the fiscal year ended March 31, 2014. The difference appears to have stemmed from the net income of subsidiaries. Which subsidiary reported the highest net income? We do not disclose results of individual subsidiaries. The Ricoh Group conducts consolidated-based management; therefore we advise that you review our performance on a consolidated basis. Ricoh appears not to comply with the order issued by the Tokyo Metropolitan Government Labor Relations Commission in connection with collective negotiations with its labor union. Should this not be a problem, in light of the growing importance of compliance? We have filed a request with the Central Labour Relations Commission, the ruling body of the Tokyo Metropolitan Government Labor Relations Commission, to withdraw the order from the Labor Relations Commission. As for the collective negotiations, we have been responding to the labor union sincerely to the utmost extent. Based on the Labor Union Act, the order from the Tokyo Metropolitan Government Labor Relations Commission should remain effective even if you appeal to the Central Labour Relations Commission for its withdrawal. Why do you not comply with the order? First, we would like to seek for the view of the Central Labour Relations Commission. However, we sincerely intend to continue talks with the labor union. The Ricoh Group shall address every matter including this issue, in accordance with legal procedures and with all sincerity. What are your business development plans in the ASEAN and Indian markets? Our target is to double net sales in the emerging markets in three years. To this end, we plan to implement measures, including the launch of products that correspond with market needs. What is the Company’s vision for 2020, the year in which the Tokyo Olympic and Paralympic Games will be held? We are anticipating how the world will evolve and develop towards and after 2020. In light of our projections, we intend to formulate and implement various measures including the launch of new businesses, with a view to becoming a company group that provides customers with confidence, comfort, and convenience. In relation to the aforementioned questions (Q2 and Q3), is it not a simple matter of procedure to comply with the order of the Tokyo Metropolitan Government Labor Relations Commission? We believe that the current action we have taken is the right procedure. It is our intention to continue conducting management in keeping with the spirit of legal compliance. With regard to consolidated sales by region, the sales growth rate in the Japanese market was lower than that of other regions. I strongly hope to see more growth in the Japanese market also. We will take your comment as words of encouragement. Looking ahead, we will put our domestic group companies’ strengths together to focus on further growth in the domestic market. Accordingly, we are set to integrate our sales and service companies in Japan on July 1. Historically, our domestic business base has been solid in terms of sales and it already commands a high market share. This is the reason why the growth rate of our domestic sales is lower when compared with those of overseas regions. On the other hand, our sales in overseas markets, particularly within emerging economies, have potential to grow even more. Although this is a personal opinion, in an exhibition in Japan that I attended, much to my regret, I observed that Ricoh presenters did not seem to convey much enthusiasm in promoting the Company’s products. Please allow us to offer an apology for the disappointment caused to you. We will investigate the facts and take steps for improvement. The figures for year-on-year changes in consolidated sales by region show extremely high growth rates in overseas regions. Is not this due in part to the impact of exchange rate fluctuations? That is correct. Fluctuation in foreign exchange rates is an inevitable risk in the operation of a global-based business. We are trying to reduce foreign exchange sensitivity through various measures, including the expansion of a global-based procurement scheme. In fact, thanks to these measures, our forex sensitivity has been declining. How is the Company addressing the adoption of the International Financial Reporting Standards (IFRS)? From the fiscal year beginning April 1, 2014, we begin to disclose financial information in accordance with IFRS. The impact on the Company’s income from the adoption of IFRS should be insignificant. How is the Company coping with country risk? In our company, both our manufacturing and marketing functions are operated on a global basis; therefore we manage our businesses while taking into consideration country risk at all times. For example, we try to mitigate and diversify country risk by pursuing business operations rooted in the local market. How does the Company plan to use the Omori Office (Nakamagome, Ohta-ku, Tokyo), the venue for the General Meeting of Shareholders until the previous fiscal year? The Omori Office is the registered head office. We will continue to make effective use of the office. I would like to ask for an increase in shareholder returns. I think the Company should make more effort to enhance the communication of corporate information with a view to improving its share price. We plan to continue paying dividends to our shareholders with a target of 30% total payout ratio. Also, we will take steps to further enhance our communication of company information. The Company’s consolidated sales by category shows that the sales tend to concentrate in the Office Imaging category. Do you think high dependence of sales on a specific product category presents some risk to your future business development? The Office Imaging category is the foundation of our business; we will continue to attend to the expansion of this category. However, we will swiftly develop its components in an effort to meet customer needs that change with the times. In addition, we strive to develop new fields of business, including the servicing business and communication tools. How is the Company planning to deploy female employees more effectively? We see diversity in the workplace not as a duty but a natural consequence. Going forward, we will closely apply ourselves to the deployment of female employees even more effectively. What is the reason for the sharp decrease in the year-on-year comparison of long-term loans receivable on the non-consolidated balance sheets, as disclosed in the Notice of General Meeting of Shareholders? The year-on-year change in long-term loans receivable on the non-consolidated balance sheets reflected the transfer of funds between the Ricoh Group companies; it was not caused by any noteworthy factor. In addition, it had little impact on consolidated financial results. Please disclose the income by segment. Operating income for the Imaging & Solutions, Industrial Products, and Other segments came to ¥184.6 billion, ¥5.3 billion, and ¥0.2 billion, respectively. I think the Company should proactively allocate management resources to develop new products for Ricoh’s future. 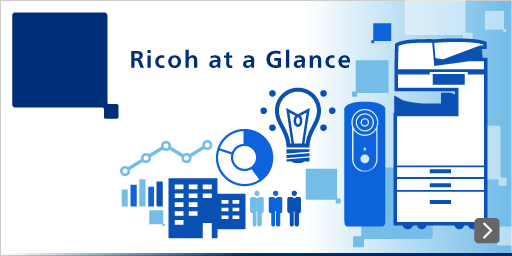 R&D investment plays a role in shaping Ricoh’s future business. As a manufacturer, we invest around 5 to 6 percent of our net sales in R&D activities, regardless of the amount of profit. We continuously pursue the development of new products for the future. The acquisition of PENTAX has helped us to enhance our product line by adding single-lens reflex cameras to our lineup of traditional high-end compact cameras. Further, by integrating optical and image processing technologies which the two companies have developed over the years, we have successfully entered into the industrial camera market as well, in addition to the consumer camera market. I would like for the Ordinary General Meeting of Shareholders for the next fiscal year to be held around the same time as this year. We will consider meeting your request.